Join the discussion on our forums! Come discuss Spirit of the Frog over in our dedicated Spirit of the Frog discussion topic. I'm sure there is something here, I'm just not sure it's more than just a meme. Overload does not trigger, when opponent is dead. it's massive value, that'S for sure, but Shudderwock has kind of proven that SHaman doesn't necessarily need tons of draw to get a combo deck together. This expansion we get so many smart cards. For skillful players, who can build a deck around this mechanics, this card is great. It means, this card will barely see play as most players just want to smork. Turn 4: Haunting Visions, draw Hex (only 4-cost spell), cast either discovered spell or cast Hex, draw Volcano/Bloodlust (depending on build) if Hexwas cast that turn. 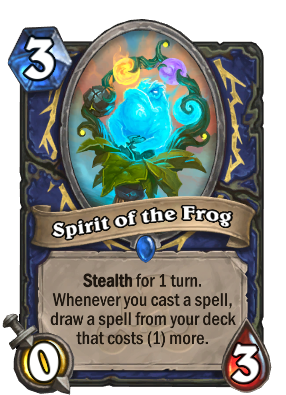 But what is really going to separate this card from neat to strong is what Kragwa, the Frog Loa will do. This seems very powerful. Not sure what the power level is like in Wild but it's hard to imagine that Midrange Shaman won't be a contender with a card that lets it blast you with a string of spells while keeping its hand full. This card should draw the spell with the same cost from the deck. Have a feeling they made it 3 instead of 2 to avoid it making it to the even shaman deck? How do you play this in even shaman? play spirit, play a 2 mana spell, look at your screen 10 sec, unistall.